Coulrophobics – those scared of clowns, obviously – prepare yourselves, because Pennywise is coming back in It: Chapter 2, and it looks like it’s going to be a terrifying experience. Stephen King’s It was scary enough when it existed only as words on a page, but the 2017 movie proved to us that the visual experience is just as horrific, if not more. But the fear doesn’t stop with the first instalment, as Pennywise’s return in It: Chapter 2 looks as terrifying as ever. The first footage of the upcoming movie was shown at Comic-Con in San Diego yesterday, and even just that short preview was enough to get people shaking in their boots and running from red balloons. Director Andy Muschietti appeared on screen at the clip viewing to tease the audience about Chapter 2. It’s gonna be a more intense experience, so bring your adult diapers to the theatre. The clip showed the Losers’ Club at a Chinese restaurant, but key to the storyline of the sequel, the members of the group were all grown up. The adult Losers will be made up of Bill Hader, James McAvoy, Jessica Chastain, Isaiah Mustafa, Jay Ryan, James Ransone, and Andy Bean. The adult cast follows the story of Stephen King’s novel, where Chapter 2 is set 27 years after the original, and the Losers’ Club return to Derry as adults. From only the short glimpse of the sequel, Bill Hader is being highlighted as a show-stealer. Of course the sequel wouldn’t be complete without an appearance from everyone’s most feared clown and luckily Bill Skarsgård is back on board to fill the role. The Losers’ Club cast appeared all together a couple of weeks ago at what seemed to be a script reading, with the caption reading ‘Back to Derry with these Losers. #ITMovie’. The movie began filming about a month ago, as announced by James McAvoy when he posted a picture to Instagram with the caption ‘Day 1 on IT 2’. 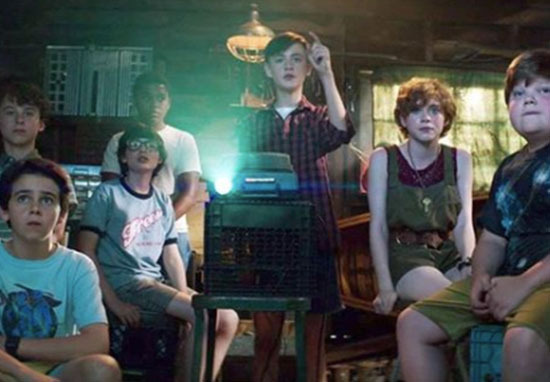 Those lucky enough to catch the sneak preview of It: Chapter 2 have been tweeting their thoughts on the movie, giving us an insight into what they witnessed. So we didn’t get to see much besides a few brief clips and some behind the scenes footage but the anticipation for IT: CHAPTER 2 is unreal. Sequel is gonna be huge #Scarediego. Fans are desperate for more clips or insights to the movie, and have taken to Twitter to share their excitement for the return of Pennywise. I just want to see that IT chapter 2 footage. Please oh god please. It: Chapter 2 is set to be released in the UK and US on September 6, 2019.